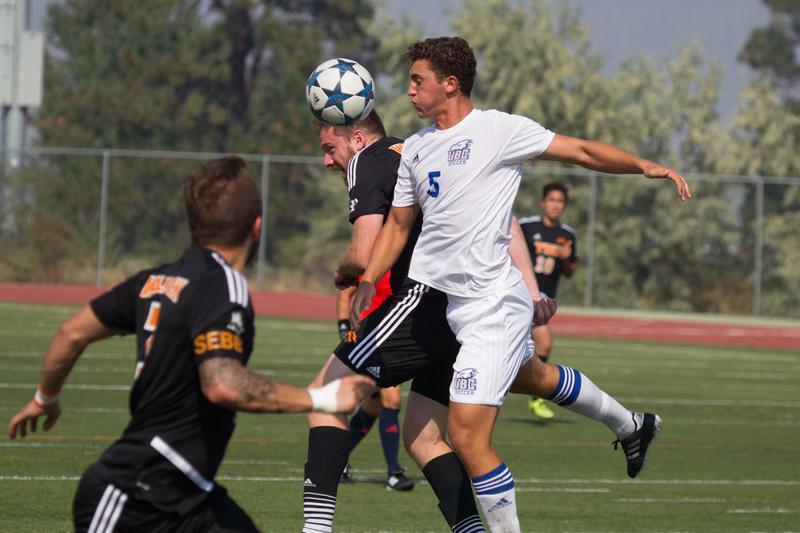 In their final game of the 2017 season, UBC men’s soccer will once again face the Thompson Rivers University (TRU) Wolfpack in the post-season — this time for the bronze medal at the U Sports national championships. Two disappointing semifinal outcomes this weekend — a 4-2 loss in overtime for TRU and a 2-0 loss for UBC — have led the Wolfpack and the Thunderbirds to cross paths once again, but who will be victorious and claim both a U Sports medal and some Canada West pride? The two teams are well acquainted this season, having faced each other three times in the last two months. In the regular season, Thompson Rivers were the only team to tie against UBC, securing a 2-2 scoreline in UBC’s fourth game of the season. Just over a month later, the ’Birds dominated the Wolfpack at Thunderbird Stadium, taking a 3-1 win. UBC would repeat that scoreline in the Canada West Final Four last weekend, which would send them to the gold medal match and to an eventual Canada West title. As TRU are the hosts for this year’s nationals tournament, they also earned themselves a place in the championships. Likely not the medal match either team was aiming for yesterday, both will have to shake of their semifinal woes and bring it all to the pitch tomorrow morning. If their past match-ups are any indication, this will be a close one. With Thompson Rivers hosting the national’s tournament this year, they have the evident home fan advantage. Having watched their match up against Cape Breton Capers last night, the Wolfpack has a huge support system in the Kamloops community. Our sports writing team were front row spectators for a heckling onslaught from the TRU fans aimed right at Cape Breton goalkeeper Ben Jackson, which ended with some exchanging of words between players and fans. UBC is likely in for something similar to the Capers, if the Wolfpack supporters have anything to say about it. In the last month, UBC has comeback to win the game in the second half on five separate occasions, three of which have occurred in the post-season. Two weekends ago, UBC’s Mackenzie Cole evened up their Canada West quarter-final against Mount Royal in the 58th minute, with Kyle Sohi taking the match for UBC in the 100th minute. The following weekend, in their Canada West Final Four game against Trinity Western University, UBC scored three goals in thirty minutes to overtake the Spartans with a 3-2 win. Just two days ago, UBC played the same type of game, defeating the University of New Brunswick Varsity Reds with a comeback goal from Ryan Arthur in the 83rd minute. In overtime, Rylan Sangha scored the ’Birds go-ahead goal to send them through to the semifinals. Though a nerve-racking style of play for fans, the T-Birds have shown they can pick up their game in the second half and push past their opponents. They’ve even done it twice against TRU, evening up the game with two second half goals in their first match-up on September 3, and overtaking the Wolfpack on October 13 with three goals in the last ten minutes of the game. Up front, both sides have one of the nation’s best strikers in their tool kit. For the Wolfpack, Mitchell Popadynetz has scored seven goals and notched ten assists. His counterpart at UBC, Victory Shumbusho, has scored nine goals, with Patrick Izett filling in the assists column for UBC with six. UBC fact: TRU’s Mitchell Popadynetz played for UBC in the 2013/14 season, playing 17 games for the 'Birds and scoring three goals. Both teams have had outstanding seasons in terms of keeping up positive momentum. For UBC, they haven’t had two consecutive losses since September, when they saw defeats against the University of Alberta and the University of Northern BC in the span of one week. On the other hand, TRU hasn’t had two consecutive losses all season. Both are coming off a loss on Friday night — neither will be looking to continue that trend. TRU has home advantage. ’Birds have the Canada West title and history against the Wolfpack on their side. It’ll be a close one, but someone will come out victorious. UBC and Thompson Rivers kick off for the bronze medal at 11 a.m. on Sunday, November 12. The game can be watched live on sportscanada.tv/usports.